When looking for the best spotting scope for hunting, the range, or just nature watching, it's easy to get confused by all of the different choices. 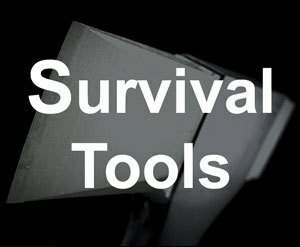 Which one is the best to go along with your gun scope? 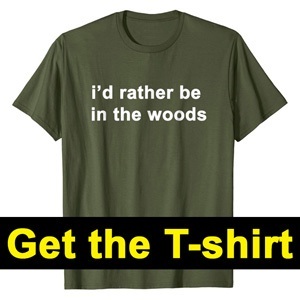 Or which one should I get for bird watching? 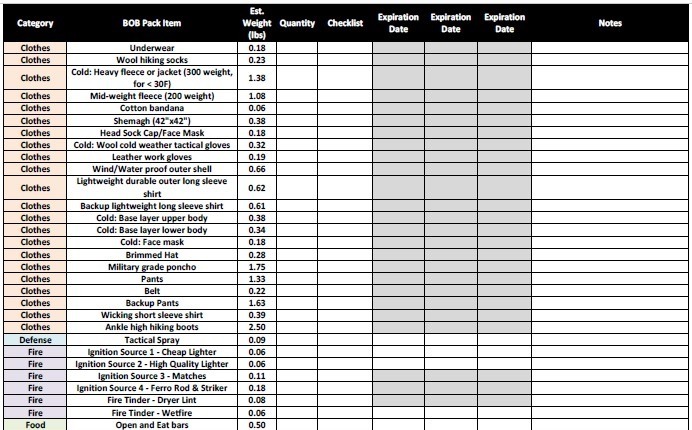 You can end up spending a lot of money, but is it what you really need or too much? In this article, I'm going to show you what main features you need to pay attention to. After covering the criteria, we are going to look at the top 3 out there that have the best quality for the lowest price. First, let's take a look at a comparison table to give us a big picture view on the top 3, then we will jump into the criteria. If you are looking for something smaller and more compact, consider getting a really good monocular instead. What else is a spotting scope if it's not one that can let you see clearly over the entire range that you need it for. For most of us, whether we are shooting at the range or on the hunt, our gun scope will have a certain magnification that allows us to shoot accurately at a specific distance. At the gun range, the gun scope, while helping us hit the target, may not have enough zoom to give us the feedback we need to know how close we are on the target board. It takes a lot of time to wait for the fire line to go cold, and then walk out to the target to see how we did. Whether we are sighting our rifle in, or just wanting to check a 3-5 shot grouping, we need to be able to see details. For hunting, we want the ability to see out farther around us to know what is going on and where possible game might be. And usually our gun scope can't provide us with that much zoom. 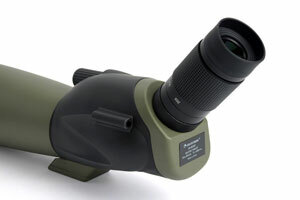 The most popular gun scope configuration is a 3-9x magnification, followed by a 4-12x. This gets us accurate shooting out to 300-500 yards typically. 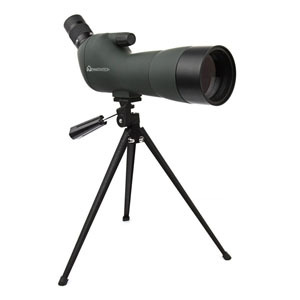 The most popular spotting scope configuration therefore is a 20-60x magnification range, which means we get a 20x minimum and a 60x maximum zoom. This is great coverage to help us see our targets clearly and also to look around us on the hunt. Pro Tip: Consider using black splatter paper targets that are a bright color when shot. This creates a lot of contrast that makes seeing details tremendously easier with a spotting scope. Regular white paper targets with bullet holes usually do not give you good contrast to see far away with any spotting scope. Now that we understand how magnification plays a role, let's discuss the objective lens. Light enters the objective and gets focused through the scope into our eye, where we can see the image at our set magnification level. The simple theory of it is that the bigger the objective lens is, the more light gets into the scope. What this means is that with more light, we get a brighter image. The catch is that the more magnification we use, the more it starts cutting down the amount of light that makes it to our eye, making the image dimmer. Understanding these physics, it makes sense that we would choose to get a bigger objective lens to help us see nice bright images over the entire magnification range of the scope. Some typical objective lens sizes that we should go for is 60 mm or 80 mm. That gives us enough light getting into our scope to give us bright images. 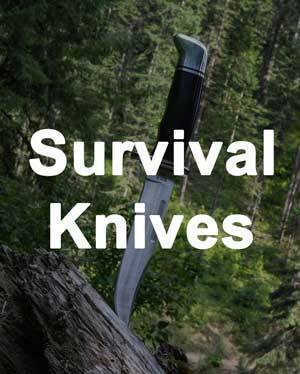 I don't know about you, but by the time I've bought my rifle, my gun scope, and other gear, money starts getting tight. And that is just one gun. Some of us have multiples. 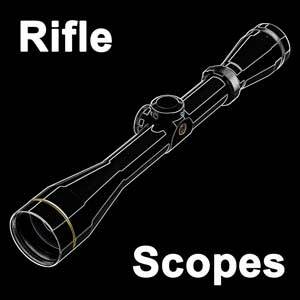 Therefore, I need a spotting scope that performs very good, but isn't more expensive than one of my gun scopes. 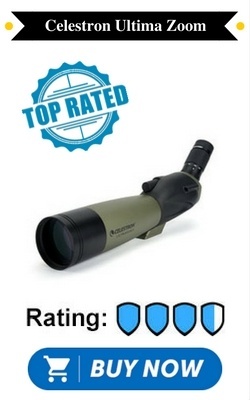 Luckily, there's some great scopes out there that perform extremely well, but are also very affordable. We'll cover them next in detail. 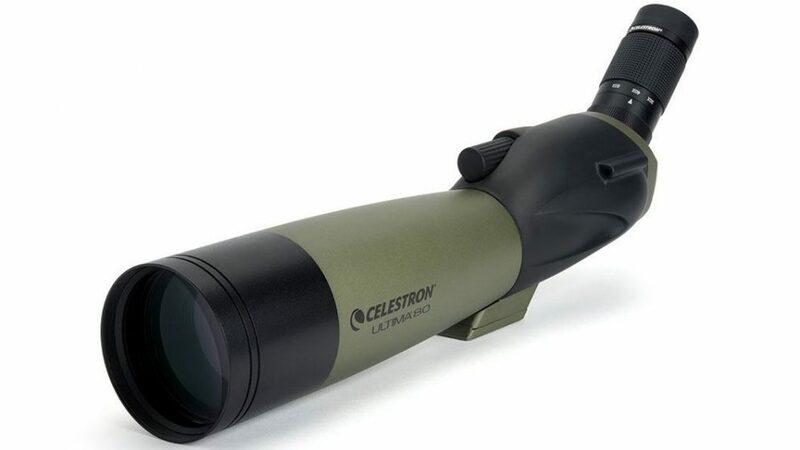 If you are looking for the ultimate balance of performance to price then the Celestron Ultima Zoom 20-60x80 is the best choice. This spotting scope has a 20x to 60x magnification range, which means you'll be able to see your paper target great up to 400 yards. Some users can even see their targets as far as 800 yards if you are shooting that far out with high caliber and black splatter targets. 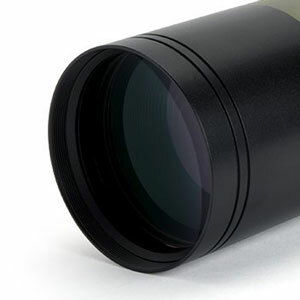 The objective lens is 80 mm in diameter, giving you nice and bright images. It comes in either straight or 45 degree angle eye piece options, which gives you flexibility on your specific setup depending on which one you get. The scope has great coatings on its optics for high performance. It is a nice scope for the gun range. 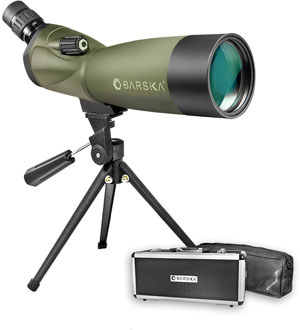 If you want great performance but are a little tight on budget, consider the Barska Blackhawk 20-60x80. It also has a 20x to 60x magnification range, which is very versatile. The objective lens is also 80 mm, letting in plenty of light to make it usable under most conditions. This scope comes with a 45 degree angle eye piece, which can be handy at the gun range so you don't have to get up from your rifle seat to take a look. 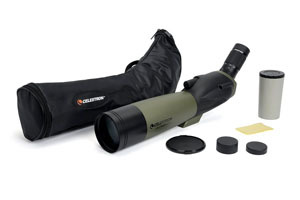 Great selling features are that this scope is both water and fog proof. 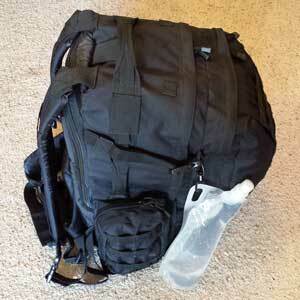 It also comes with a table tripod and a hard shell carrying case for protection. There is an extendable sun shade as well to reduce glare. All of these features make this scope perfect for hunting. If you are on a shoe string budget, then check out the Emarth 20-60x60. It has the 20x to 60x magnification, which is great. This scope has a 60 mm objective, which means it won't let as much light in as a 80 mm lens. If you plan on using it on nice sunny days, then this should not be an issue for you. This scope is also water and fog proof. 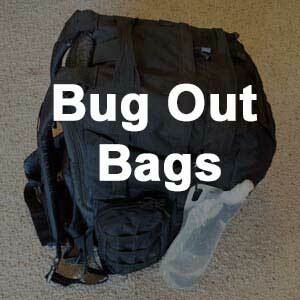 It comes with a table tripod and a soft carry bag. We looked at several factors that you need to consider when getting the right spotting scope for you. For example, we discussed why magnification is a key factor and why a 20x-60x magnification range is ideal to give you the most versatile spotting scope. Next, we talked about how the objective lens is a key factor in how bright the image will be when you are looking through the scope. Price is usually a factor for most of us, so it's important to get a decent scope that is good quality but that isn't outrageously expensive. Then we looked at the top 3 choices on the market right now. 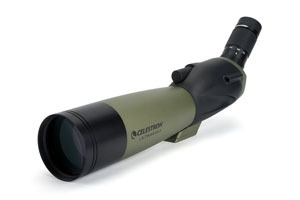 The Celestron Ultima Zoom 20-60x80 is a solid performer at a decent price.